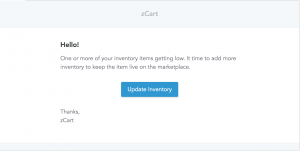 Here you can manage everything about your inventories, orders, supports and notifications. You can set ALERT quantity level of your inventory. The system will send you a notification email if any of your items goes below this level so that you can take action fast. You can turn off the notification on notification settings. This section is to configuring order rules. 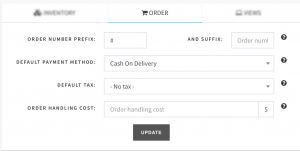 You can set handling cost that’ll be added with the calculated shipping cost on the checkout page. You can set the order number prefix and suffix, defaults for payments, order tax etc. here. 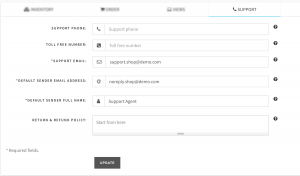 Set customer support information like email, phone numbers, address. You can also set default sender email address and name here. You can turn on/off your notifications here.